The workshop has come a long way since converting the living/dining room into a space for my manly endeavors and creating a concrete floor. Our house is painted throughout in a color that just isn’t our taste.This shade of yellow-beige made the workshop appear rather dingy, and not light and airy. That needed to change. 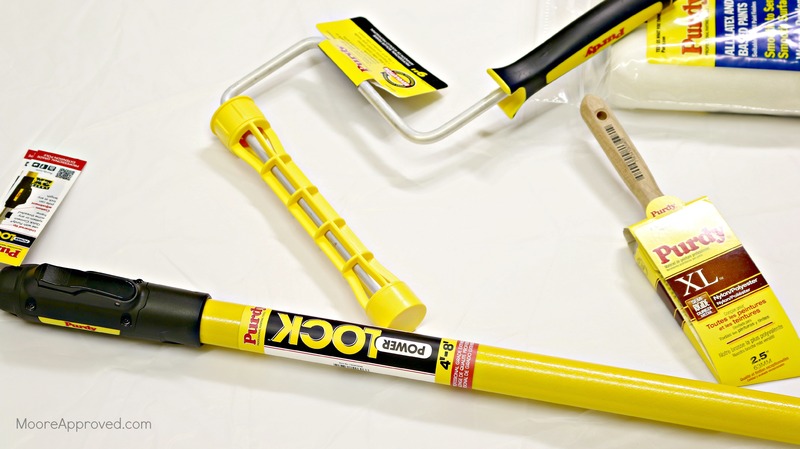 Coincidentally, around the time I was ready to get started on painting – Purdy reached out to ask if we wanted to try out the complete line of Nylox paint brushes, Power Lock professional grade extension pole, Revolution Frame, and White Dove roller covers. Using the combination of these products definitely made the work easier and faster. The Revolution Frame is a much-improved version compared to the wood and metal frames traditionally available. There’s a Quick Connect feature to attach it to the Power Lock professional grade extension pole or a standard threaded pole. Both products are designed to be lightweight to help reduce arm fatigue. 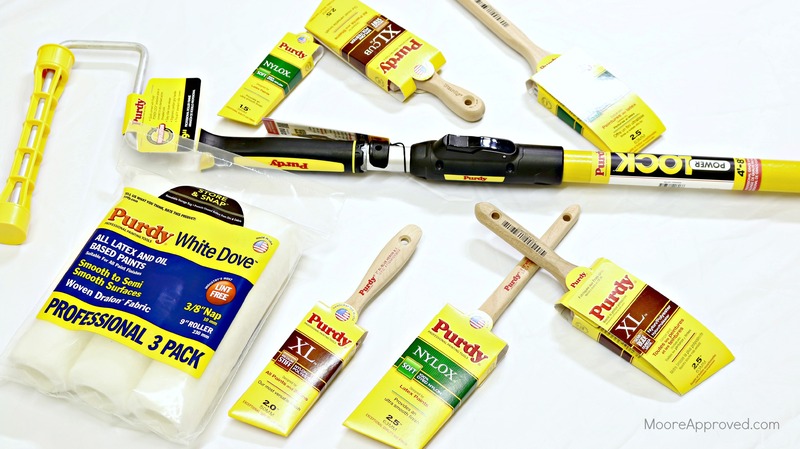 Purdy’s White Dove series can be used with all types of paints and stains. The roller covers are manufactured with a high density weave made of Dralon – a form of nylon. 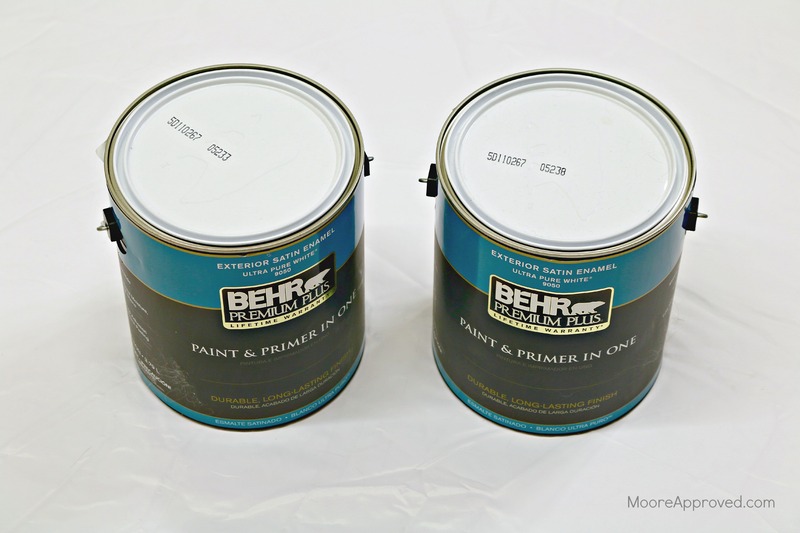 For durability, I prefer to use Behr Premium Plus Exterior Paint and Primer in One for interior jobs. 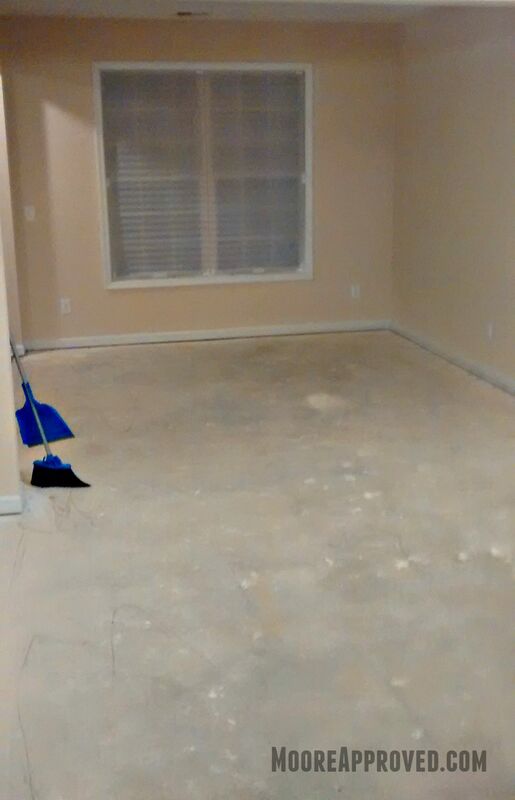 Clean up is so easy and we are willing to spend a few dollars more for paint that can stand up to the elements. 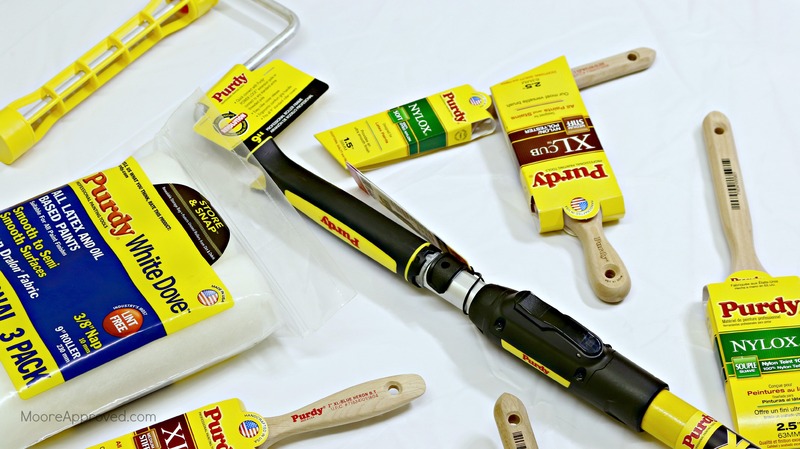 Finally, let’s talk about what Purdy is so well known for – its high quality paint brushes. Each one is handmade in the USA and “signed” by the maker with a personalized sticker. The company actually started out in a garage in Portland, Oregon back in 1925. Founder S. Desmond Purdy aimed to create the finest painting tools for both the professional and the consumer. Purdy sent us a variety of flat and angled paint brushes from the XL and Nylox series. XL is the most versatile brush series, designed for use with all paints and stains with a distinctive copper ferrule. The bristles are comprised of a few different types of materials and come in soft and stiff types. Nylox brushes provide an ultra smooth finish designed for use with latex paints. They are handcrafted with 100% nylon filaments. Jen and I have had our share of experience with painting. We’ve used cheap tools and higher quality tools. Particularly with paint brushes, good ones are worth their weight in gold. They produce a much better finish, are more enjoyable to use, and last exponentially longer with proper care. Overall – we would definitely recommend the Purdy line for your DIY supply collection – giving them the ‘Moore Approved’ seal! Purdy products are available at The Home Depot at different prices to fit anyone’s budget.